It is an installation method. It may be blocked by anti-virus measure software, but please do its best without giving it up. 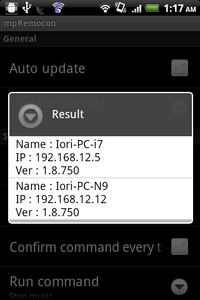 １．Download a server application and an Android application. ２．Install a server application in a PC installed iTunes in. The window is not displayed, and an icon is displayed by task tray. ※The warning of the fire wall is given at the time of first time start, but of course please admit it. 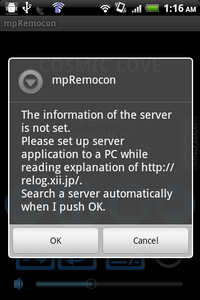 ４．Please start mpRemocon by Android phone. It seems to become a lower image. You search a server automatically when you push OK. Please choose a found server. You push the returning button, and finish a setting screen. When you are already playing music by iTunes, you can watch the music information. ６．Let your music life fill up! ・It is convenient when you set it with a setting screen between base time. ・You make it a charge state, and carrying please do not do sleep. Because there is the consumption of the battery, the present conditions do not block sleep. A.Please review a fire wall and setting of the anti-virus measure software. Q.We cannot start server application. The icon of the short cut changed without permission when it started. A.There is a possibility that it was quarantined anti-virus measure software. Please set it so that it is not handled as a virus. * When we display it in a playlist, there is the case that time needs. Indication takes time number of the music 500 from the area. It may take several minutes depending on a case.